Northwest Guilford Coach Darlene Joyner was named The Associated Press Girls Basketball Coach of the Year after guiding the Vikings to a 29-2 record and a second consecutive NCHSAA Class 4A state championship. If perfection isn’t possible, then Darlene Joyner and Elissa Cunane are the next best thing. 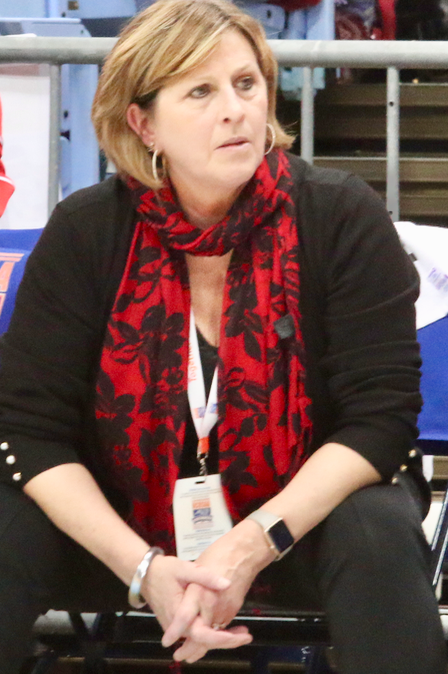 The two earned The Associated Press Coach of the Year and Player of the Year honors, respectively, for their roles in guiding their teams to NCHSAA 4A and and 3A state championships. At the helm of the Northwest Guilford Vikings, Joyner guided the defending champions to a second consecutive win over nationally ranked Southeast Raleigh for the 4A title in Chapel Hill. The Vikings finished with a 29-2 record. Both losses came to out-of-state teams. Cunane, meanwhile, propelled Northern Guilford to its second straight 3A title. She averaged 20.4 points and 12.6 rebounds for the 28-4 Nighthawks, with two of those losses coming to Joyner’s Vikings. In her team’s 60-52 win over Jacksonville in the 3A state title game, Cunane shot 8-for-8 from the floor and finished with 23 points and 21 rebounds. Senior Viking Elizabeth Kitley was named to the AP all-state team along with Cunane. Kitley, who signed a national letter of intent to study and play basketball at Virginia Tech, averaged 18.4 points and 10.4 rebounds per game for the Vikings. In the title match against Southeast Raleigh, Kitley tallied 18 points, eight rebounds and three blocks in the come-from-behind 44-36 victory. Northwest Guilford Vikings senior Elizabeth Kitley was named to the AP all-state team. 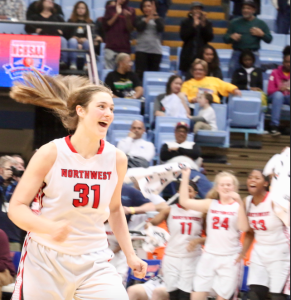 Here, she’s all smiles after nailing to clutch free throws in the final seconds of her team’s come-from-behind victory over Southeast Raleigh in the state title game.